Can you believe it’s already Wednesday? We still have a lot fun challenges ahead of us but I’d say our party is at full swing! I hope you’re enjoying the Virtual Card Making Party as much as I am. Remember that all challenges posted this week will remain open until Sunday night so there is still time to join in the fun. This challenge is a simple and fun one. Create a BIRTHDAY CARD. Our wonderful sample card was created by Ronni. Now put on your party shoes, grab your hats and noisemakers and share your birthday card with everyone here. Great birthday card! Love those cupcakes and the sentiment cracked me up! Love the card Ronni! This is one I might be able to do since my son's birthday is Saturday. So I have birthday on the brain. Love the card. So fun! 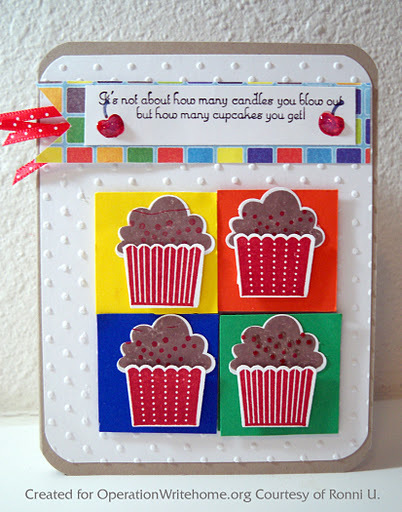 Ronni, your cupcake card is just yummy! I love the images and colors! So festive!